Okay. Harken to my tale. 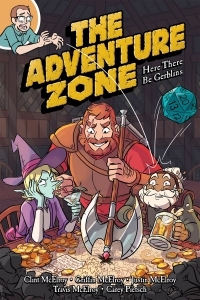 Once upon a time (a couple of years ago) there were these brothers who had a bunch of really successful podcasts, and they decided to do a new podcast with their dad, where they all played D&D together as a family, and lo, this new podcast was called The Adventure Zone, and verily did it get downloaded over 10 million times, and wow did it totally eat the brains of all who listened, because: It was just. That. Rad. AND THEN did these guys team up with artist Carey Pietsch, and make a graphic novel where the weirdly sweet and brilliant but also super SUPER vulgar and honestly kind of bizarre story of The Adventure Zone got adapted into a goofy, innovative, and compelling graphic novel! Let no man deny that it was the best idea ever, right? Reader, we're publishing it. Based on the McElroy family's smash hit podcast, a graphic novel following the metafictional adventures of three D&D characters and their interfering Dungeon Master, with art from rising star Carey Pietsch.